Freedom to the Black: Erdem Helvacıoğlu :: February 10-26, 2012 :: ARTER – space for art, Istiklal Caddesi, 211, Beyoglu, Istanbul, Turkey. ARTER’s new series of sound art projects opens with the exhibition Freedom to the Black by renowned Turkish composer, sound designer, guitarist and producer Erdem Helvacıoğlu. Curated by Melih Fereli, the installation features Fluxus pioneer George Maciunas’s work “Piano Piece” (1970) along with Helvacıoğlu’s composition inspired by Maciunas’s very piano, which is in the Vehbi Koç Foundation Contemporary Art Collection. During the first ever performance of Maciunas’s work, Ben Vautier, the French performance artist, nailed down all the white keys of this upright piano one by one, rendering the white keys immovable and thus leaving only the black keys functioning. The accomplished composer Erdem Helvacıoğlu recorded the ‘sound memory’ of Maciunas’s piano to create his astonishing 10-minute composition, Freedom to the Black. 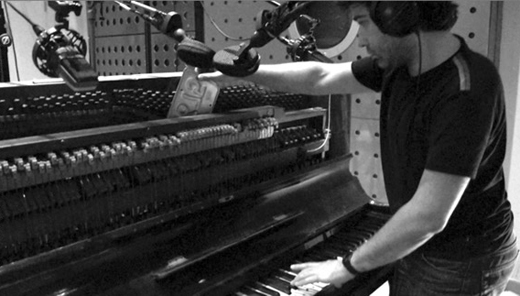 He accomplished this over a four-day recording session, by using various pieces of equipment and materials — scissors, bows, earplugs, stuffed toys, drum sticks, mallets, hammers, screwdrivers, pieces of silk and wool, among many others things—to extract a wide range of sounds from the piano’s body. Helvacıoğlu used 17 microphones with diverse characteristics and in unconventional placements for the recordings. For the spatial design of the installation at ARTER, the artist and the curator collaborated with Dr Tony Myatt, director of the Music Research Centre at The University of York. Freedom to the Black utilises an innovative sound system, “Ambisonic B-format”, here used for the first time in Turkey. The system is installed in a specially designed ground-floor room at ARTER and it involves sixteen speakers that surround the audience in three dimensions for full spherical sonic diffusion. An initiative of the Vehbi Koç Foundation (VKF), ARTER’s programmes are created with the aim of encouraging production of contemporary artworks both nationally and internationally, providing a platform of visibility for artistic practices especially in Turkey. ARTER offers artists a sustainable infrastructure for artistic production in terms of funding, exhibiting, promotion and publications, as well as support for educational activities. Freedom to the Black inaugurates ARTER’s “Sound Art Projects” series. ARTER has added this exciting area of artistic production to its repertoire and it will continue to commission and exhibit new works in this genre.